that I have seen varied in condition. One set had seen some hard usage in the Vietnam conflict, the stitching was ripped loose, the carrying strap was cut and there was something missing from inside the top cover. The second set revealed that the missing item was a schematic for the telephone along with some rather detailed instructions for trouble shooting. The second set was brand new and had never been in service. It was in excellent condition. It is interesting to note that the Japanese made leather covers for most all of their telephones during WW II. Those sets and leather items that saw service in China have held up very well. The leather items sent to the jungle areas quickly deteriorated. These leather cased sets were probably adequate for use in China but would not hold up well in the jungles of Vietnam. The next set apparently was the Type 65- 1. This set is very similar to the Type 65 but comes in a moulded green plastic case. It is more adapted to the humid jungle of Vietnam and was probably designed for use there. Both sets are designed to be powered by something like a D-Cell. There is a holder for two of these but the standard D-Cells in the USA will not fit. A C-cell is also just too small. The set that I picked up was new in the box and had the desiccant bag and the shipping document and the colourful instruction manual. These sets require one wire or two for successful operation. With one wire line, the second terminal must be connected to the ground terminal with a jumper wire. When I tested two of these telephones and with two wires connecting them, the ringing circuits work but the talking circuits do not. I connected these two phones together with three wires and got them to work one way. I concluded there must be a problem with the circuit in the one as it would not receive. Both of these sets appeared to be very flimsy and not well suited to a combat environment. At least the Type 65 or a similar type set was captured in Vietnam and was discussed in the July 1967 Technical Intelligence bulletin. After 1967, very few, if any of these sets were still in use and captured. Chinese 0743 Field Telephone The next stage in the development of Chinese telephones, and a quantum leap forward for the Chinese but a giant leap backward in design, was the Model 0743. This telephone is much more rugged than the Type 65's and is almost a carbon copy of the Soviet TAI 43 telephone, copied from the 1933 German field telephone. This comes in a moulded Bakelite type case, has provisions for easy replacement of the hand set if damaged, through the use of a removable plug and socket.. This set can be used with a two wire line system or a one wire system, but it requires a special telephone battery. It copies the 4.5 volt battery of the German telephones and also the Russian telephones. Two Radio Shack C-cell holders in series will fit in the centre battery compartment and will power the set.The telephone has a cradle on top for the handset to rest in. It also has a socket on the handset plug so that an extra earphone can be inserted so a second person can monitor the conversation. 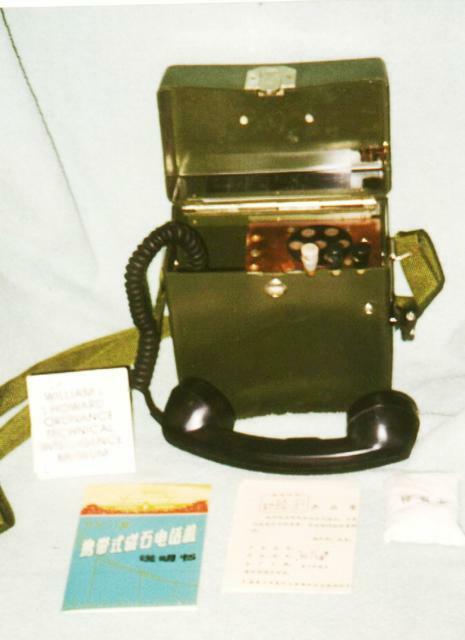 Chinese CX2 Field Telephone It has instructions and a schematic diagram on metal plates fastened into the top cover by rivets. This phone was also made with the designation 0745 which is the export model. There is also a version with the designation of CX 2. The 0743 was the most commonly captured telephone in Vietnam at least through 1968. After 1968, the CX 2s were recovered. All three of the above telephones have ringing voltages in the range of 80 to 95 VAC depending on how fast the crank is turned. The talking circuit functions on 3 volts DC from the batteries. 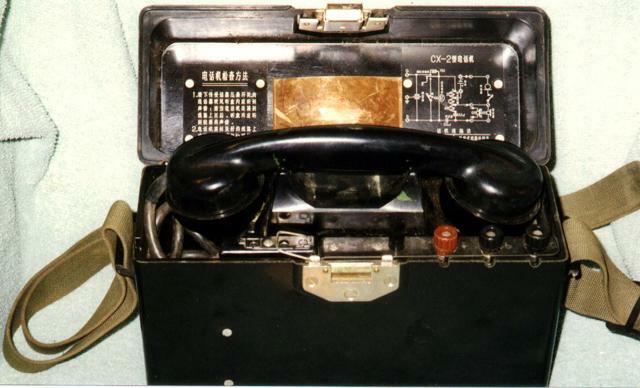 In addition to the Chinese telephones, a Yugoslav Desk telephone, identified as a TM 50 was captured as were Polish wet cell storage batteries. A telephone that was a copy of the U.S. EE 8 was reported as a Q 07 which may have been the Vietnamese designation for the Type 65 Chinese telephone. There were two main switchboards captured in Vietnam. 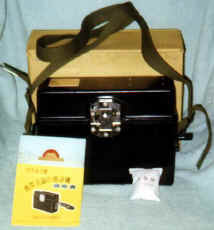 A Chinese 10 line cordless switchboard in a grey sheet metal case. It was 9" x 10 1/2" x 6 1/2 " and weighed 20 lbs. It was powered by 2 1 1/2 volt dry cells. The second was also a Chinese 10 line switch board which was a copy of the Russian PK 10 switchboard. This is a corded switchboard and was 7" x 12" x 5 1/2 " and weighed 10 pounds. This set was housed in a Grey sheet metal case and was powered by the operators telephone. The Russian had replaced the PK 10 with a newer version, the R 193 so it is assumed the tooling and dies were transferred to the Chinese. It is interesting to note that the Japanese during WW II used cordless telephone switchboards, while the U.S., Germans, Russians and most others used corded switchboards. Cordless switch boards are more complicated and costly to build, and the operators require more training. Corded switch boards do not require costly parts, extra training and can be figured out by most troops. The corded switchboards usually had an operators pack and headset while the cordless switchboards required the operator to have his own telephone. This meant one more item of equipment to be transported and in the fast moving pace of jungle warfare this was difficult.